BRISTOL - Losing to a crosstown rival is never easy. Losing 64-3 to a crosstown rival is even more difficult. But for Bristol Central head coach Matthew Boissonneault, the lopsided defeat at the hands of Bristol Eastern didn’t feel like an embarrassing blowout. Sure, the Rams claimed just one match en route to losing its ninth-straight to the Lancers, but aside from lopsided victories from Eastern’s Tommy Nichols, Justin Marshall and Dylan Garcia, Central found itself in every match through the first period, but were unable to close any out aside from a 2-1 decision for Jake Aldi on the final match of the night. 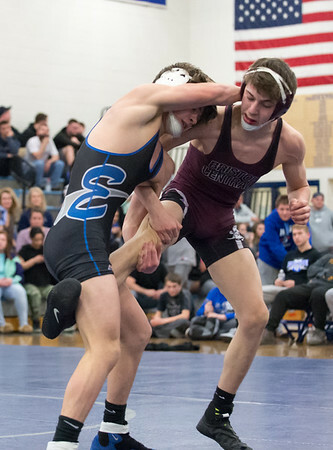 While competitive matches against the third-ranked team in the state is a reason for optimism, Boissonneault knows the hard-fought battles have to turn into wins soon, especially with the regular season officially over, and postseason tournaments awaiting next. The Rams finished the regular season at 18-7, but their youth has shown in tight contests that needed a big point to turn any number of matches in their favor. So far, Boissonneault has struggled to find it from his young team that included eight underclassmen in its lineup against the Lancers on Wednesday night. With the CCC Tournament awaiting this weekend, Bristol Central hopes to conquer its inexperience and finally thrive in crunch time. If the Rams are able to, they could point to matches like Wednesday night at Bristol Eastern, where they were dealt another painful lesson that could make them better in the long run. And while the loss may still sting now, as losing to a rival often does, Boissonneault said both before and after the match a date with the Lancers would be a helpful barometer to see where his team was at with postseason tournaments approaching. There isn’t much time to improve with the postseason just days away, but in the eyes of Boissonneault, there have already been signs of improvement over the course of the season, enough to feel optimistic about the direction of the program. Come Saturday, the optimism needs to turn into results, for the sake of the Rams’ season. Posted in The Bristol Press, Bristol Central on Thursday, 7 February 2019 21:42. Updated: Thursday, 7 February 2019 21:45.